I haven't made too much progress as far as decorating our home, which means the mantel in our family room is still bare. I'm having a hard time deciding what I want to put on it, and how simple or decorated I want it to be. Naturally I've turned to blogs and Pinterest for inspiration. Here are a few pretty mantels that have caught my eye. The first one is my favorite. You should add some vintage photos to it. Maybe old family photos. Very pretty! I love them all. I like how they all have a neutral tone but are bold in beauty! I love all of these...for some reason I can get inspiration to decorate everything but the mantle...my mind just goes blank!Gotta love Pinterest to get you back on track! Mantels are so tough! I've been switching mine for the seasons, keeping the same picture above the mantel, and I kind of like that. Your inspiration pics are beautiful! Can't wait to see what you decide on! I love,love the second one. Don't beat yourself up over rushing and decorating everything. 4 years in our house and I still have empty spots that I am trying to decided what to do....LOL I guess I'd rather take my time than to rush it and not be satisfied with the results! I love the first one! A friend of mine made those little pompom flowers as take away favors for a baby shower. They are so cute! This is my favorite part about moving - decorating! The first one is my favorite, and I really like how in the last two the pictures are just leaning against the mantle. But no matter how minimal or decorated it is, you need to use at least one thing that has a memory or meaning behind it! I think the last one looks most like you, but a couple others are close behind. Whatever you choose will look great! The nice thing about the photos leaning against the wall is you can change things easily as you're trying it all out without making holes in the wall. i love a beautiful mirror over a mantle and simple flowers/vase/picture frame so it can be decorated for holidays without having to move too many things around. yes - i think about decorating for holidays when thinking about normal decorations, hahaha. and i love all of these photos - perfect inspiration - and envious you have a mantle to decorate. one day! 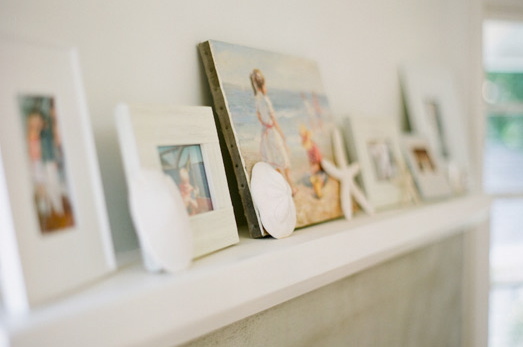 Love that beach inspired mantle! So pretty!